Android introduces a cool new feature to ensure protection of private data to it's users by Pattern Lock technique. It is a unique thinking , other than remembering or setting difficult combination of password characters whether in numeric or alphabetic form. 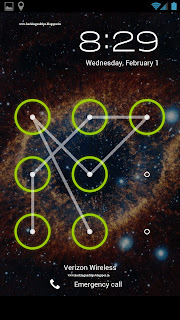 Pattern lock provides a huge set of patterns to choose from. User may set any unique and different pattern according to their wish anytime. With advantage of locking screen using this unique way , there is also a problem that sometimes many of android users have to face i.e. what if they forget the pattern they had used to lock their device or try to unlock it with wrong pattern number of times that turned device to get locked permanently ? If you stuck in such problem so dont worry there are three methods to unlock your device. 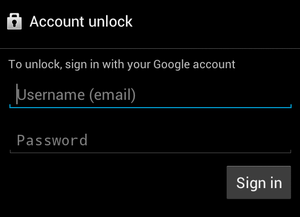 First method includes a simple way of logging in to your Google account and then getting RID of that lock pattern.This is easiest and most recommended way of unlocking your device.So if you have entered wrong pattern for 5 times and then if it is showing you the Forgot Lock Pattern option, then you can login through your Google account and bypass the lock pattern system on your device. Step 1: Connect your Android Phone to Your Computer. Step 2 : Open command prompt as administrator. 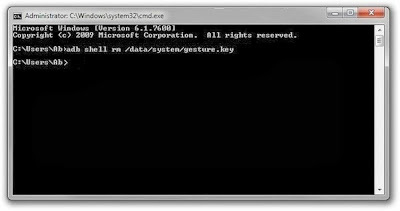 Step 3 : Now in command prompt window type the following code carefully exactly as it is and then press enter. Step 4 : Now you will some screen as shown below and then you can reboot your phone and now when your will start again then try unlocking your phone using any random lock pattern and it will work pretty fine. Step 5 : If you face any problem repeat same steps but instead of the above code try using adb shell rm /data/system/gesture.key and then press enter and now try rebooting your device to see if it works. Hard Reset is an inbuilt feature of android phones and tablets and every device has it. This method will unlock your device but will remove all user's data and settings as well. You should use this method when none of the above methods work for you and you need to unlock your device urgently. 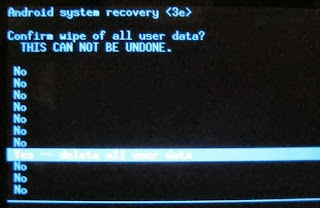 This will remove only the data from phone memory and not from the SD card available in phone. Step 1 : Switch off your phone. Step 2 : Now while turning your phone on , you need to press some specific combination of keys. Generally it is volume up + power button in many of the android devices so try them first and if they dont work for you so here are list of some popular device combination keys or else better way is to google it. Step 3 : Now when your phone starts up and you see the logo of your phone , leave the power but but continue holding the volume up button until you see android recovery screen. you will see some screen like shown above. Just navigate to wipe data/factory reset using volume keys and then press Power button to select it. Step 5 : After you reach to Yes option , select it by using power switch and then it will erase all data on your phone and will unlock it and so ready to be used once again . So these were possibly all methods for unlocking Android device and to Bypass the pattern lock of android device but if you know any other methods so please do comment below and I will add your method too .